After running around Thamel to get the Nepalese SIM cards, currency exchanged, last-minute shopping, and loading up on carbs – it’s time for action! Last night, Bimal (our tour organizer) dropped off identical large duffles along with sleeping bags for each of us and asked us to (re)pack our stuff. It’s a common practice for the trekking companies to provide rugged duffle bags with their names/logos so porters can identify them and there is no worry about damaging our fancy bags on the trek. Since I like my EagleCreek Cargo Hauler with two large side pockets, I decided to use my own duffle for the trek. Now that we are all packed up and ready to roll, it was time for Bimal to introduce us to our guides, Deepak and Tshering, and give us the lowdown on our expedition. Knowing we have a medical doctor experienced with high altitude trekking with us, he was somewhat at ease about detecting altitude sickness early enough to avoid any major issues. After the meeting we all head out for a nice dinner before we go on the famous Dal-Bhat diet for the next several days. We woke up to light showers next morning. Bimal came to pick us up to go to the airport to fly to Lukla. After a hearty breakfast, we all board their mini-bus and head to the airport. 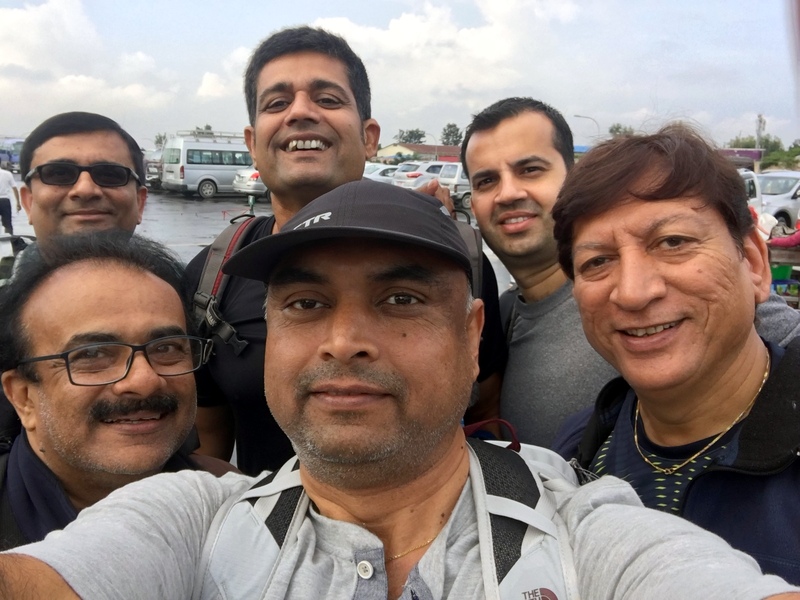 We reached Kathmandu domestic terminal, a low profile building adjacent to the Tribhovan international airport, around 7 am. After going through luggage screening and metal detectors, we entered one large high ceiling hall with all the airlines counters on the left and some seating area to the right. Most of the domestic airlines are privately operated and have interesting four syllable names, Goma, Tara, Yeti, Agni, Sita, etc. 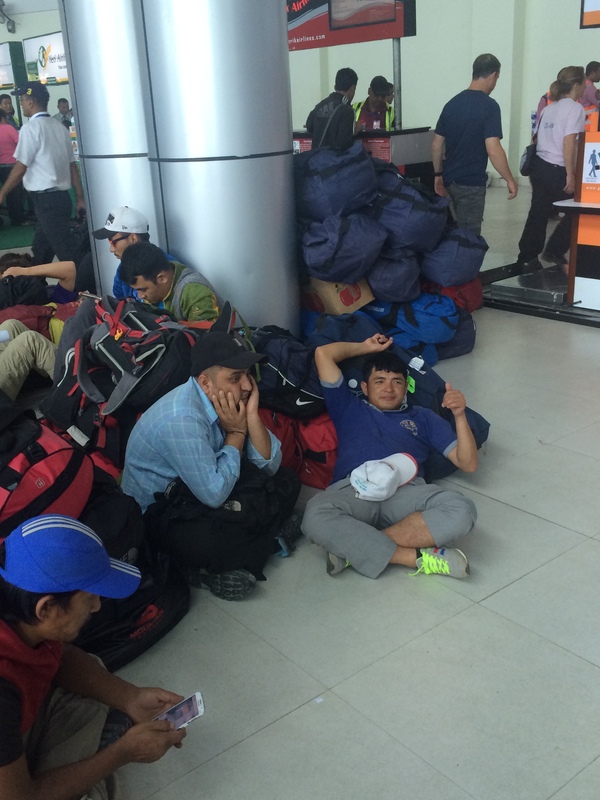 There was an organized chaos at the airport. 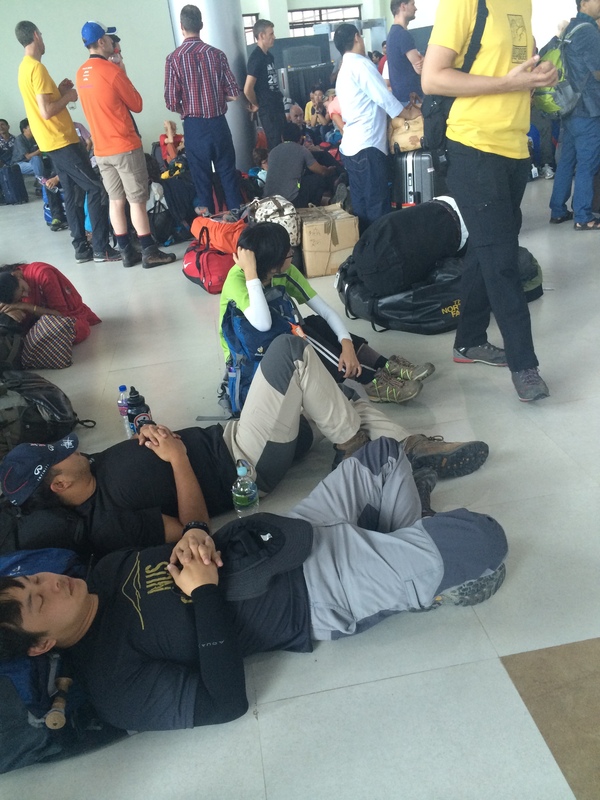 Several hikers were camped out there since early morning hoping to get a flight to Lukla. 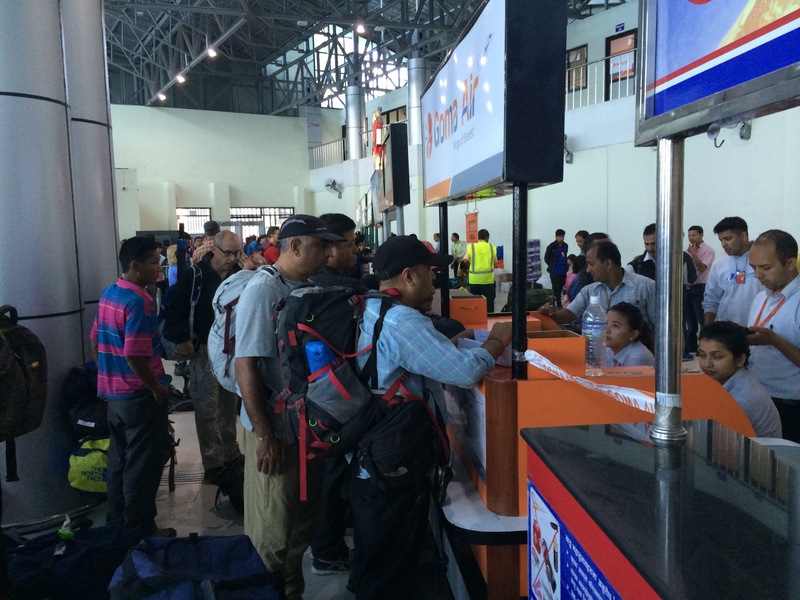 Kathmandu to Lukla Flights routinely get delayed or cancelled due to weather conditions at Lukla. It is always a good idea to add some extra days in your itinerary. 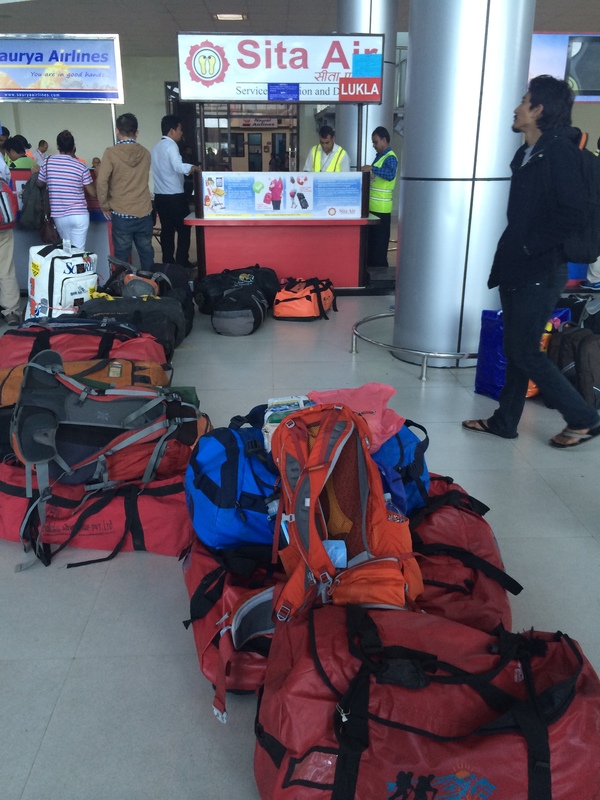 Our reservation was with Goma airlines and our guides helped us with lining up our duffle in front of the counter. 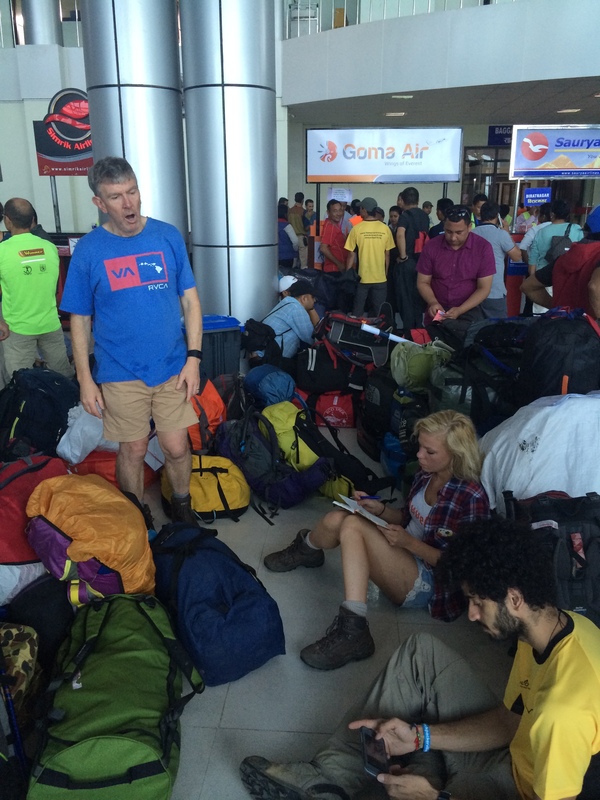 We soon discovered that there were several flights cancelled on previous two days so there was a huge backlog. The system there is you put your duffle in line to reserve your spot while you wait across the hall, take a nap, eat breakfast, or do yoga! Taking advantage of the long waiting period, a group of hikers found an empty corner upstairs and started their daily Yoga practice. We learned that the weather at Lukla has been very unpredictable in last few days with rain and heavy fog limiting the number of flights per day. Most airlines make multiple trips up until mid afternoon and pretty much shut down after 4 pm. 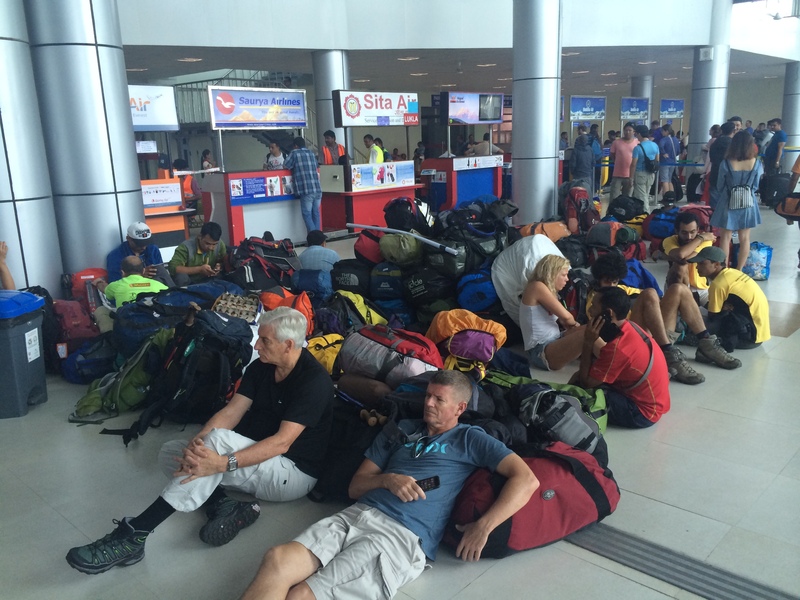 Looking at the sheer number of hikers waiting to fly to Lukla, 20 passenger capacity per flight, and limited hours to fly, we soon realized that it may take us a day or two before we get our turn. Using their local connections, our guides soon confirmed that. What a bummer! Plan B. While I had built several extra days before and after the EBC trek for such circumstances, others in our group had limited flexibility. On top of that, we also realized that we are not guaranteed a flight next day due to backlog and prevailing weather conditions. 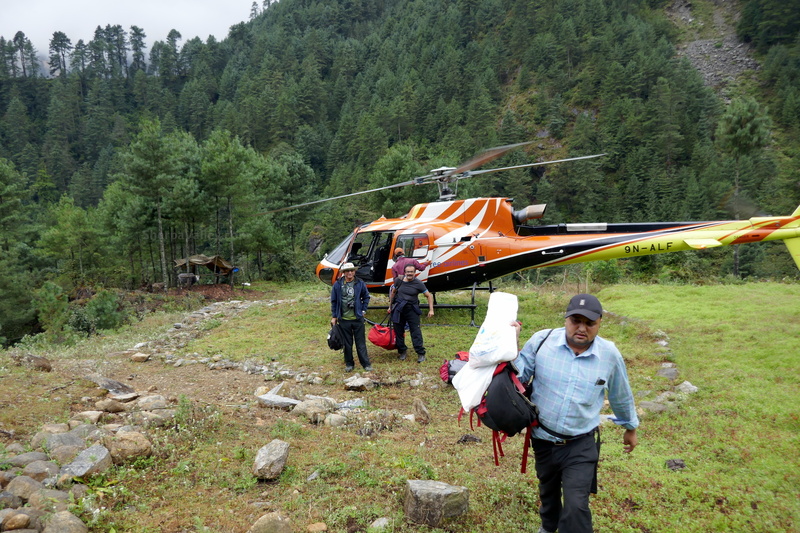 So its time for Plan B – Charter a helicopter to Lukla. You don’t have to put in much efforts to find a helicopter company as their agents are roaming around the waiting area and will find you! Soon, our chief negotiators, Manubhai and Doctor, were in conversation with several helicopter operators to explore our options and get the best deal. Within minutes we were seating in front of Mingma Sherpa who runs helicopter services under Sree Aviation. When you travel you never know who you going to meet and under what circumstances! 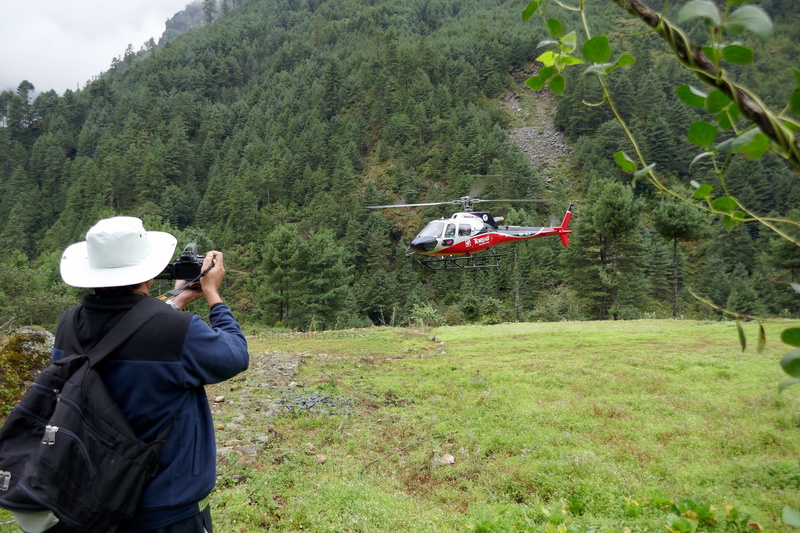 When we started negotiating a helicopter ride to Lukla, we were ultimately connected to Mingma Sherpa. Mingma is down to earth guy with a pleasant personality and a trademark sherpa smile. Seating behind a small wooden desk in a tiny office at the airport, he was constantly working a couple of cell phones to figure out when he can get us two helicopters (we were six plus two guides, and a whole bunch of luggage). After we spent an hour or so talking with him and had a few cups of coffee, we started developing a rapport with him. We soon learned that he is the first Nepali and the first South Asian to scale all 14 of the world’s highest mountains – an outstanding achievement and a milestone in South Asian mountaineering history. Not only that but he became the first mountaineer to climb all 14 peaks on first attempt. He was so enthusiastic in sharing stories about his brother, his trips to foreign lands, his business, and of course his expeditions. I was pleasantly surprised when he honestly said he has only studied up to 7th grade and has trouble reading and writing! In addition to his mountaineering par excellence, he is a very successful businessman and expedition leader. What a guy and what an achievement! As we say, everything happens for a good reason. Ours was to meet Mingma. We had to split into two teams as eight of us with our luggage could not fit into one chopper. So Rush, Varun, Kamlesh, and Tshering left in the first chopper and we were told to wait till the next chopper is available to fly us to Lukla. Helicopters are like air taxis and make multiple round trips (about 1.5 hour) during peak seasons. We continue our conversation with Mingma who kept us caffeinated with instant coffees. After about an hour or so, we learned that our first team has reached Lukla and we are next in line so we all pile up in a small shuttle van to go the helipad. The same chopper came back with an Australian couple and some Russian hikers who were returning from the base camp trek. By then, it was about 2 pm and the returning helicopter pilot declared it is not safe to fly to Lukla again as thick fog has rolled in. The Australian couple confirmed that the weather was changing at Lukla and they thought they will be stuck there overnight. So, we all head back to the terminal. On our way back, I strike up a conversation with the Australian couple in their late 50s, who were returning from their 8th expedition to the EBC. Why 8 times? I asked. He replied “There are no mountains in Australia.” They said on their return trip, they saw hundreds of people heading to the base camp so we will have some company. They also said that the amenities along the trail has drastically improved over the years. Not sure if it’s a good thing or bad. His wife said she had hot showers almost all the way till the base camp. When I asked what tips they may have for a first timer like me, he gesture to his head and said “its 80% up here and the rest is everything else.” I was soon going to realize that! 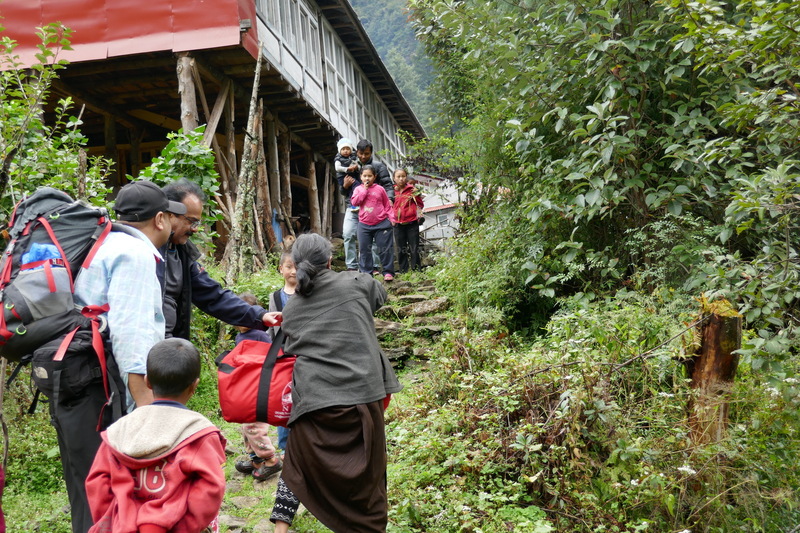 Half of our team was waiting for us to join them in Lukla and was quickly running out of daylight to trek to Phakding. Since we could not fly today, we had two options, have our team stay over night at Lukla and we join them the next day (hoping we will be able to fly) to trek to Phakding or have them start trekking and we join them down the trail. Mingma suggested that they start trekking to Phakding and his helicopter will drop us tomorrow early morning to Phakding to join them for onward trek to Namche Bazar. Finally, they started trekking late afternoon and made it to Phakding in pitch dark. Mingma was kind enough to arrange a complimentary overnight stay for us at nearby Meridian hotel owned by one of his friends and drove us there in the evening on his way home. Meridian hotel is relatively new, very close to the airport, and has a nice terrace restaurant & bar. Mingma made sure we get the best service and even arranged for doctor saheb to cook our own food in their restaurant. After reaching hotel in the evening, we decided to visit Pashupatinath Temple for the evening prayer and pick up some eggplant to cook for our dinner. Early next morning, one of Mingma’s staff picked us up from the hotel and within no time we were airborne to Phakding. Our other team was ready for us to join them in Phakding for onward trek to Namche Bazar. The helicopter ride from Kathmandu to Phakding was about 45 minutes going through scenic valley with scattered towns, terraced farms, rivers, and forest. After about 20 minutes into the flight, we saw the first gimp of snow-capped Himalaya mountain range. What a beautiful view in early morning sunshine! If you fly to Lukla, the best view of the mountains is from the left side so make sure you grab those seats first! After about 40 minutes we were flying over Lukla on our way to Phakding. Lukla airport is considered one of the most dangerous airports in the world. The small runway is tucked between a valley in the front and a mountain at the end. The plane has to make a right turn after landing to reach the terminal and has very narrow margin for errors. Soon after passing Lukla, we flew lower in the valley along the Dudhkosi river and started spotting hikers on the EBC trail. Before I know, we touched down on a make-believe helipad along the river about two hundred feet away from the EBC trail. The pilot advised us to get out quickly keeping our heads lower as he will have the chopper blades running for quick lift off. We quickly gathered our stuff and got out of the helicopter. Within minutes after he took off, I realized that I forgot my camera case with extra batteries, SDHC cards, etc. on my seat in a rush to get out of the chopper. Doctor Saheb made a call to Mingma and explained the situation but Mingma could not connect with the helicopter pilot due to phone signal issues. It was a complete disaster for me knowing I will need extra batteries and storage cards for the entire trip. 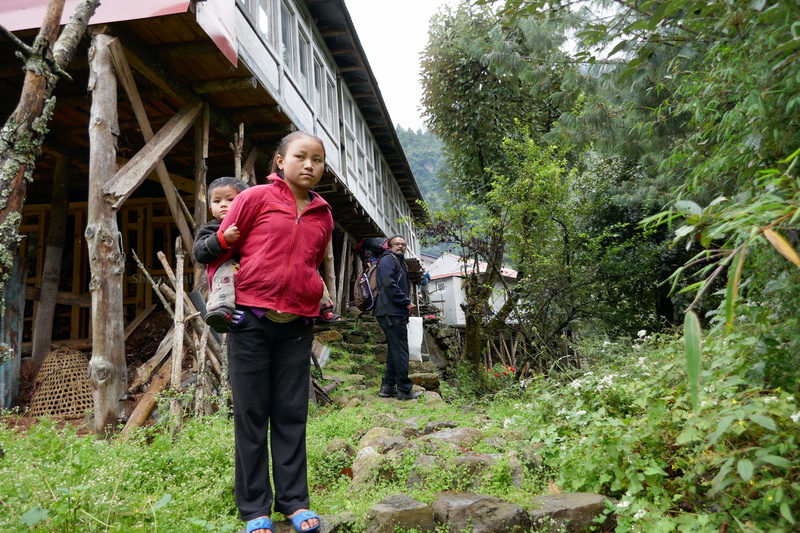 We were greeted by the Sherpa kids and a sherpa women whose family owned the teahouse next to the helipad. She even helped us with our luggage. After climbing a few steps, we were in front of the teahouse right on the EBC trail reunited with our other team and ready to march to Namche Bazaar. So, how was your hike yesterday? I asked our other team. “Oh, it was very tough” Kamlesh replied. We had to hike the last two hours in pitch black with our headlamps and it was very strenuous, he elaborated. Now in all my research before coming to Nepal, I don’t recall anyone ever mentioning this stretch to be difficult. Kamlesh and I trained together in northern California for our EBC expedition so I was familiar with his physical capacity to hike so his reply made me think what lies ahead.